The Office: "The Inner Circle"
There’s been a running narrative in the comments this season that I’ve focused too much attention on Michael Scott as a character, but I'd argue that was entirely warranted: This season was almost exclusively focused around Michael’s inevitable departure, which meant that “Goodbye, Michael” felt like the end of the season — and, one would argue, the series — rather than its twenty-first episode. But now we’ve reached the point where we are being asked to forget about Michael Scott: Steve Carell has been erased from the credits, replaced temporarily by Deangelo and what appears to be some sort of Southwest-inspired figurine, and Michael’s name is never mentioned. Instead, “The Inner Circle” jumps right into the post-Michael office, exploring the new power dynamics and continuing the kinds of storylines we saw back in “Training Day” (where all the employees were doing their best to impress the new boss). I would argue that “The Inner Circle” is more successful than that episode on some levels, mainly because it differentiates how the employees respond to Deangelo as a character. Deangelo’s fake juggling act is perhaps the most telling scene here, as you can tell who is honestly impressed (Kevin, Erin), who is forcing themselves to be impressed for the sake of remaining in the Inner Circle (Jim, Darrell, Gabe), and who is completely convinced that he is nothing but a fraud (pretty much everyone else). Back in “Training Day,” it seemed like everyone was ignoring the character’s shtick in favor of fawning over him, and I admittedly felt that more of them would immediately shift to the position they take here. However, both episodes suffer from the same problem: They’re simply not very funny or meaningful, which I'd argue is even more problematic for "The Inner Circle" given its position in the season. While the opening of the episode tries to retroactively make Deangelo into a more concrete character by turning his ever-changing personality into a management strategy, it doesn’t matter if the character isn’t entertaining and if the situations he creates are dull. 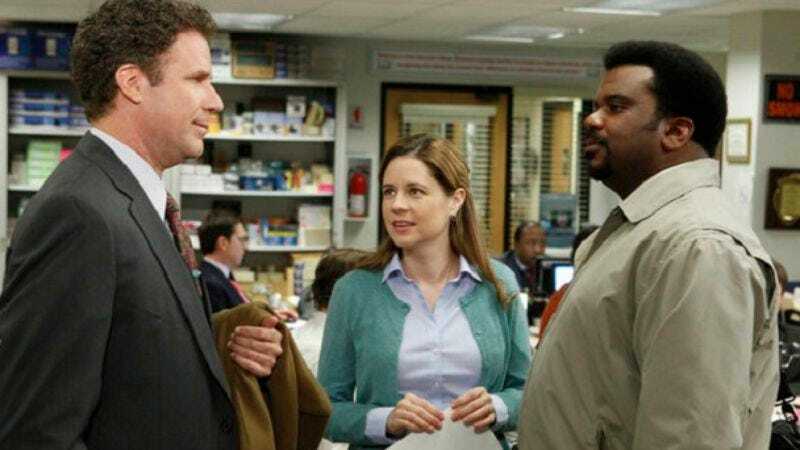 And while “Training Day” was at least able to lean on Michael’s continued presence and the beginnings of his goodbye to Scranton, there is no such resonance here: Instead, it’s just watching to see how an unfunny, poorly drawn character temporarily influences characters that we like but who lack any sense of direction. That the episode ends with “What now?” is fitting given that we have no real way of answering that question, and this uncertainty is not in the show's best interest. Sure, you might argue that sheer curiosity is the only thing keeping some people watching after Carell's exit, but that will only sustain the show for so long (and perhaps only for thirty minutes). The show spent so much time building towards Michael’s exit that they had nothing else to rely on in terms of recurring storylines, and the fact that Deangelo scrambles his brain at episode’s end renders this episode filler. For the show to justify the time spent with Deangelo, I expected them to really look at how his presence might affect the characters more substantially, really laying out a roadmap for where the season might be headed. However, Andy largely reverted back to the same character he was before last week’s successful sales call (left outside of the inner circle, and then throwing away all scruples once he’s invited in), and it doesn't feel as though Deangelo made much of an impact on any other characters. At this point, Jordan the attractive executive assistant may be his only legacy, and there’s a good chance she’ll have disappeared by the time next week rolls around. When I was among those having issues with the character of Pierce on Community earlier this season, I argued that it was an issue where the function of the character’s cruelty wasn’t worth it if that cruelty wasn’t particularly funny (which, for me, it wasn’t). However, in this case, we have a character who both wasn’t funny and lacked any function or purpose. The existence of Deangelo was convenient in Michael's goodbye episodes, but it never felt essential, and it certainly was never funny enough to be considered worthwhile. It was a waste of time, to put it plainly, and I would be very curious to know what the show’s plan for Michael’s exit was before Will Ferrell basically offered himself a role on the show. Was there a plan for a more subtle introduction of a new boss, perhaps leaving more time for the other character to rise to the occasion of Michael's absence? It's a counterfactual that we'll likely never know the answer to, but one I can't help but wonder about given the quality of this episode and Ferrell's arc in general. To be fair to “The Inner Circle,” the parts of the episode not involving Deangelo weren’t terrible. I liked that we saw more of Ryan and Kelly than we usually get to see, and that Kelly got to take a more authoritative role for a change. Kelly’s a character whose level of intelligence is always somewhat variable, especially when it comes to Ryan, but to see her shift away from her swooning over Ryan as he fakes being her supervisor was quite satisfying. Similarly, I thought Dwight’s refusal to engage with Deangelo was the one (welcome) bit of continuity from Michael’s exit, and Rainn Wilson (who is now the top-billed actor on the show) is at his best when he is allowed to play Dwight as someone with a purpose. He wasn’t just being difficult with Deangelo because he’s Dwight, he was doing it because of both a continued loyalty to Michael and because that’s just who Dwight is. It was a subtle purpose, perhaps, but it helps keep the character grounded (in stark contrast to Deangelo, who never had that grounding and suffered because of it). However, a few clever one-liners are not enough to sustain an episode that has such a substantial burden. Here is the episode that is supposed to convince skeptical viewers that the show can live on without Michael Scott, the episode that the decision to go on without Carell was not purely motivated by the dire state of NBC. Here was their chance to prove once and for all that the creative drive behind the series was not contingent on Michael Scott, and instead they spent the entire episode giving free rein to a character who becomes an invalid at episode’s end and who will likely (and hopefully) never be seen again. And even if you argue that the show's only burden is to be funny, I fail to see how "The Inner Circle" could be seen as meeting that burden. While this show may be a sitcom, and there’s often an expectation that the events of one episode won’t mean anything a week later, I don’t think this is an excuse for how meaningless this arc has been. If Deangelo had been funny, then maybe one last hurrah in “The Inner Circle” would have been enjoyable. Similarly, if Deangelo had had a purpose beyond the metatextual reunion of Carell and Ferrell, then perhaps he would have left behind a foundation for future storylines. 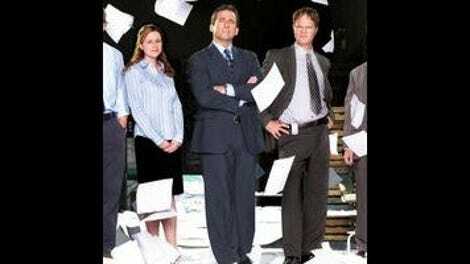 The fact is that, just a week after the show emphasized the importance of character to its connection with its audience, The Office failed to deliver a character (or an episode) that was either funny or functional at a time when they needed both more than perhaps ever before. Am I the only person who thought that final scene of a mentally damaged Deangelo was tonally off for the show? Deangelo’s fate as a whole, really, just feels like Ferrell decided how his own character should go out and nobody bothered to suggest that this is not a show where that kind of scene would be way off the mark. Just terrible. To go to the “corrupt Pam” narrative that came out of our discussion of last week’s episode, we have her trying to push her good friend Carla to the top of the list for the Executive Assistant job — drunk with power, that one. Speaking of things Pam is drunk with or was likely drunk during, Pam’s young adult book series — The Horse Flyer — sounds bloody awful. Of course, that was the point, but still - it needs saying. There was a brief moment where Jim wondered aloud if this was what the rest of his life would be like, a thread that I hope they pick up next week - here, though, it was just a pivot into the Horse Flyer joke.